Our traffic and property restrictions signs assist in directing your customers effectively. The signs are made of durable, heavy-gauge metal that guarantee a long life and are lettered with reflective materials for easy visibility. 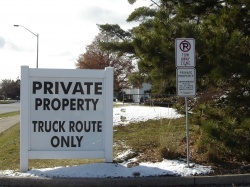 Let Ottawa Custom Signs advise you on appropriate traffic and property restriction signage. To make an enquiry about Traffic and Property Restriction Signs please contact us now. To order a Traffic and Property Restriction Sign now please click here.